They were made to be together. As part of its Creative Cloud 2018 rollout, Adobe has revealed that Microsoft's Surface Dial, seemingly made for Photoshop CC, is finally supported by the app. Adobe notes that for now, it's shipping as a "tech preview," meaning you'll have to first turn the feature on and it's not production-ready, so there may be a few bugs. You'll need to have a Bluetooth-capable PC running the latest version of Windows 10, and functionality is limited to the brush settings for now. 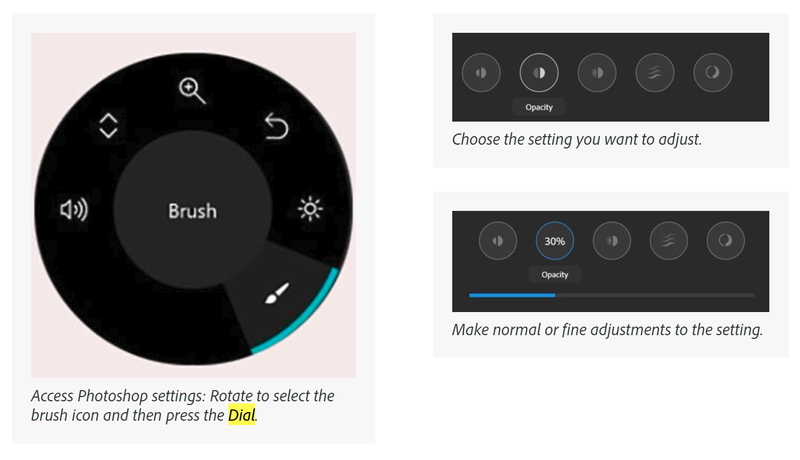 As shown in the image below, you can use the Dial to adjust the brush size, opacity and other parameters. It's unclear why it's taken Adobe and Microsoft so long to get together on the Surface Dial, nor why the functionality is so limited. As Microsoft has just released its Surface Book 2, however, there may have been some pressure for Adobe to at least do something to help motivate creative folks to look at the dial, which remains a niche product so far. I've had a chance to use other physical dials -- notably the Palette Gear -- with multiple functions on Photoshop CC and other Adobe apps, so it doesn't seem like it's that hard to implement. Hopefully, the device will be fully functional by the time Microsoft releases its next Surface Studio desktop, whenever that might be.